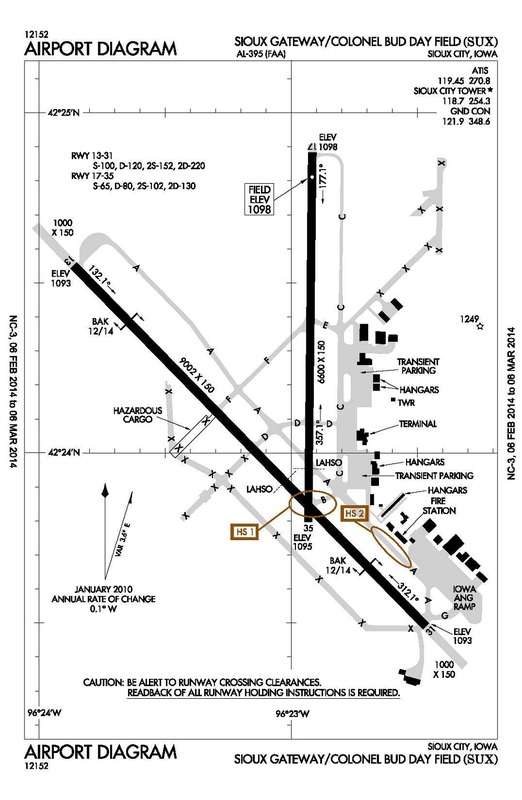 The Sioux Gateway Airport (Col. Bud Day Field) is the primary airport serving northwest Iowa, as well as nearby communities in South Dakota and Nebraska. The airport sits on 2,450 acres adjacent to the Missouri River. The airport was constructed in 1942 and served as a major training base for WWII bomber flight crews. There are 52 civilian aircraft based at KSUX, including: 34 single-engine (prop), two multi-engine, 15 jets and one helicopter. The airport also has nine military aircraft, associated with the Iowa Air Guard. FAA staffs a control tower which is open 16-hours every day and averages 46 operations per day (thus, one takeoff per 42-minutes of ATC service). The airport operations count has declined 76% since it peaked in 1992. There are two daily flights on commuters (operated under American Airlines), feeding the hub at Chicago O’Hare; these flights are subsidized by the Essential Air Service (EAS). …The 1950’s terminal building had termite damage and drainage issues. FAA and state funds covered 78% of the $6.2 Million cost of the new terminal. …For years, airport authorities asked FAA to improve the three-letter airport identifier. The choices offered by FAA were considered not much better so, a decision was finally made to embrace the letters SUX.